Got two of these during RAFM's 40% off sale in August. 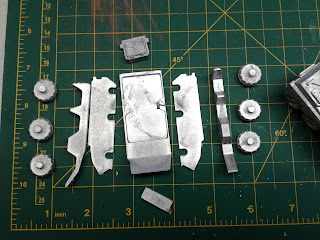 The number of parts and complexity of construction has put me off assembling until now. 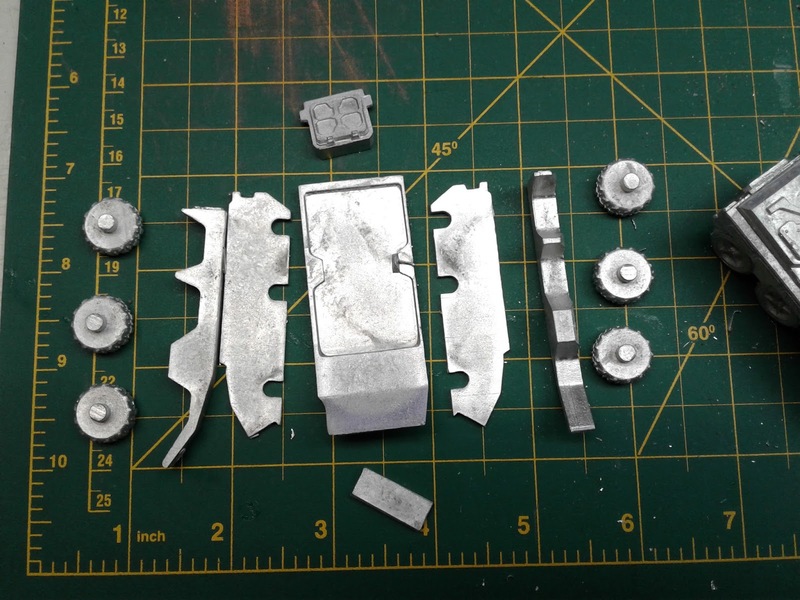 Took me three attempts to get the inner and end pieces all together, square and attached to the top. Here's the first one assembled. 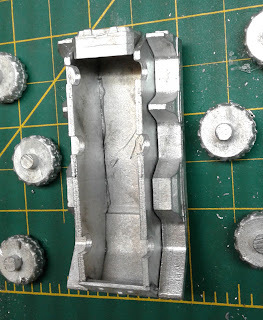 Interesting design, but I'm not sure why they had to cast the hull in so many pieces. 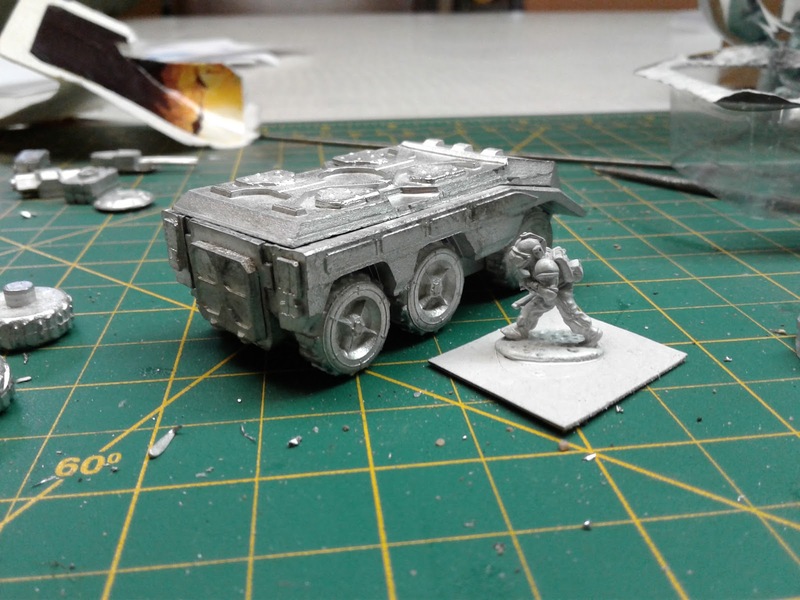 It comes with two weapon options; a remote gun turret and a missile launcher. 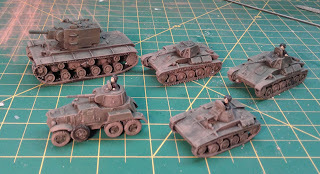 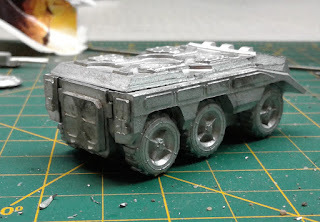 Another bit if holiday painting, the start of some armoured support for my WW2 Soviets. 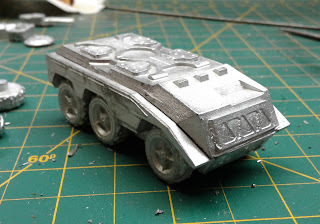 The KV-2 is a gift from the Mad Padre. 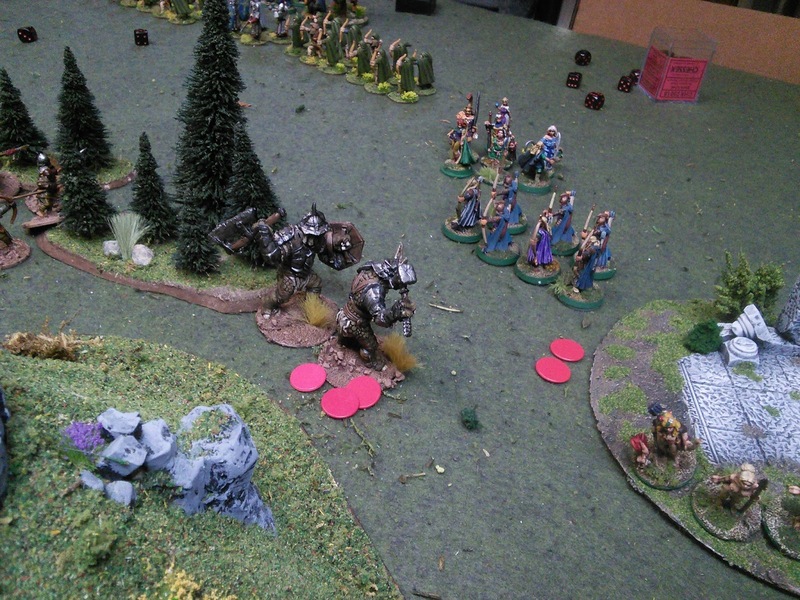 A Command Decision model, the Padre figured 3 were more than needed and sent me one. The others are all Battlefront that Mikey found for me at the Fall-In flea market. 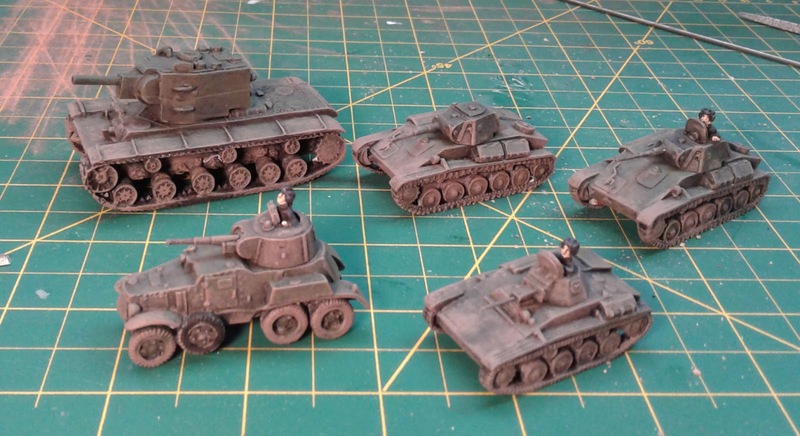 T-60s and T-70s were the last tanks I wanted, but I did say I was looking for any Soviet vehicles or artillery, and ironically the T-60 and T-70s are what he found. Mikey has a blind spot for Battlefront, or else they've become so market dominant that you can't find other, not so overpriced manufactures, in the flea markets right now. 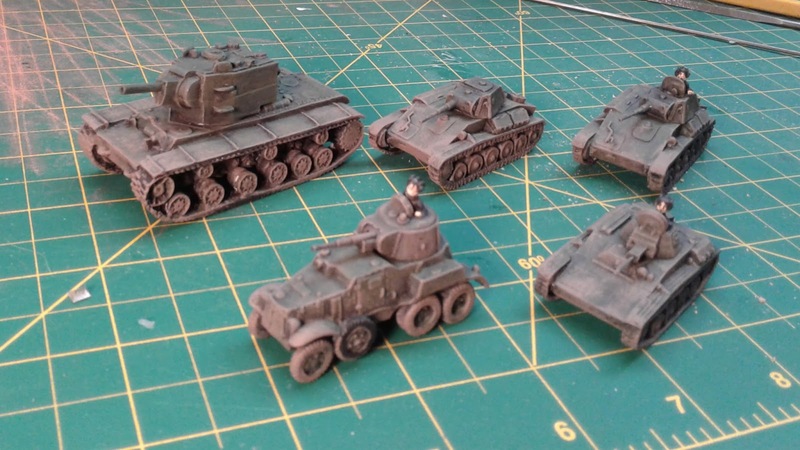 Next time I'll have to send him with some money to the Old Glory booth to get the T-26s that I really want for 1941 games. But at least my Soviets have some support now. My game last weekend drove home that I needed some markers to indicate that a unit was battered. Something better than the red rubber caps we used. 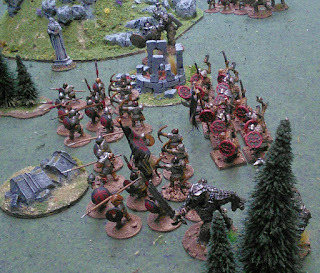 For games of Lion Rampant I have a selection of both 11th and 15th century casualty figures to mark a unit as battered. 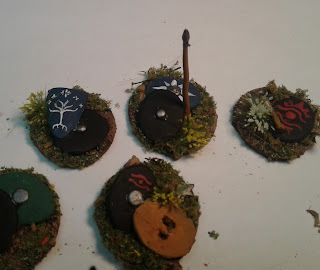 But nothing appropriate to Middle Earth. 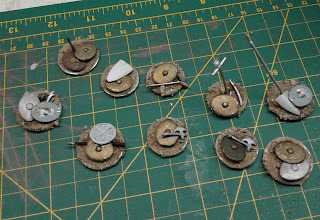 I spread caulking on the washers (taping over the holes first) and the covered them in sand. 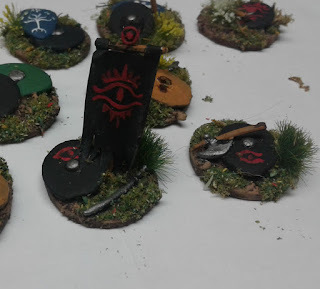 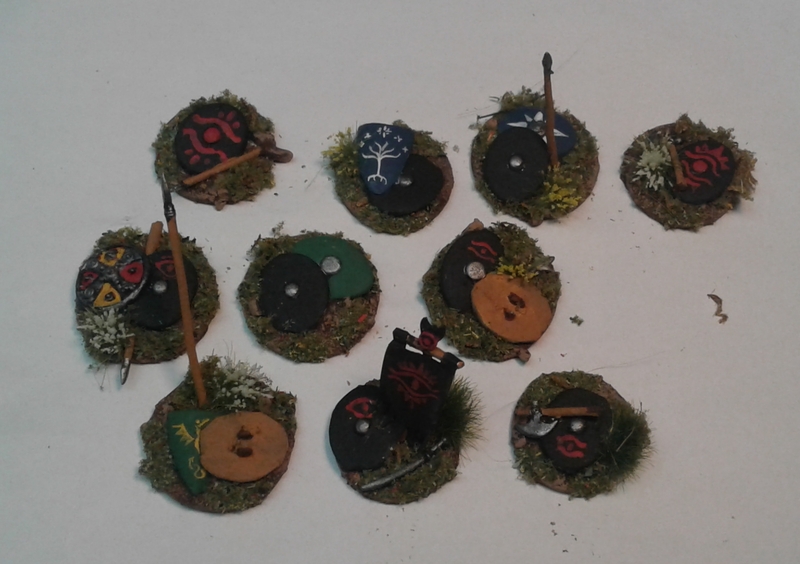 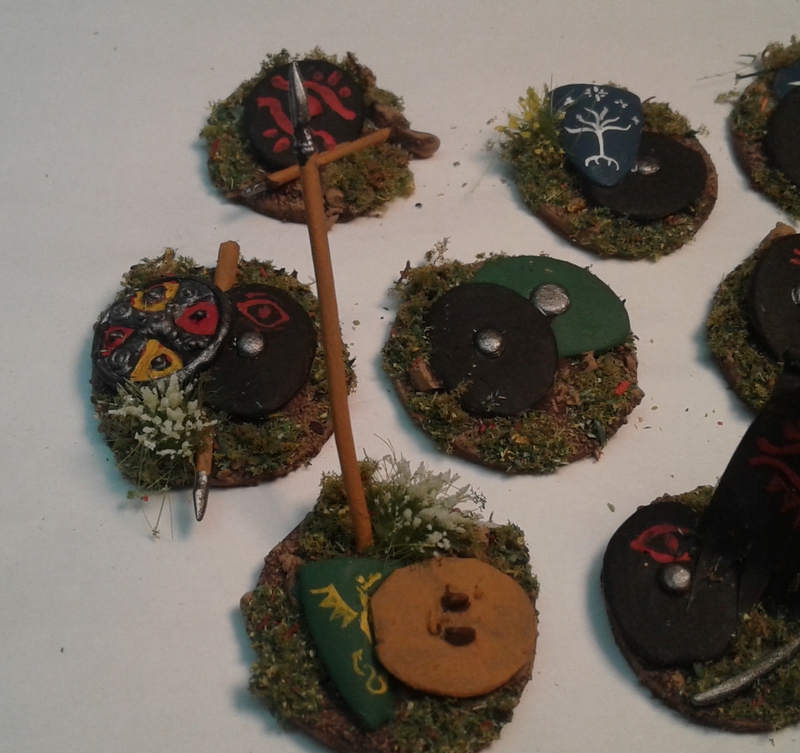 Spare shields and weapons were then glued in place to represent the broken flotsam of a field of battle. 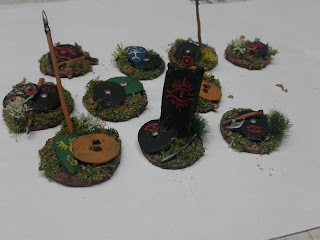 After a week of letting things set up properly, it was a simple matter of painting and flocking, mixing both Evil and Free shield motifs. I used a few flower and grass tufts to help them pop. 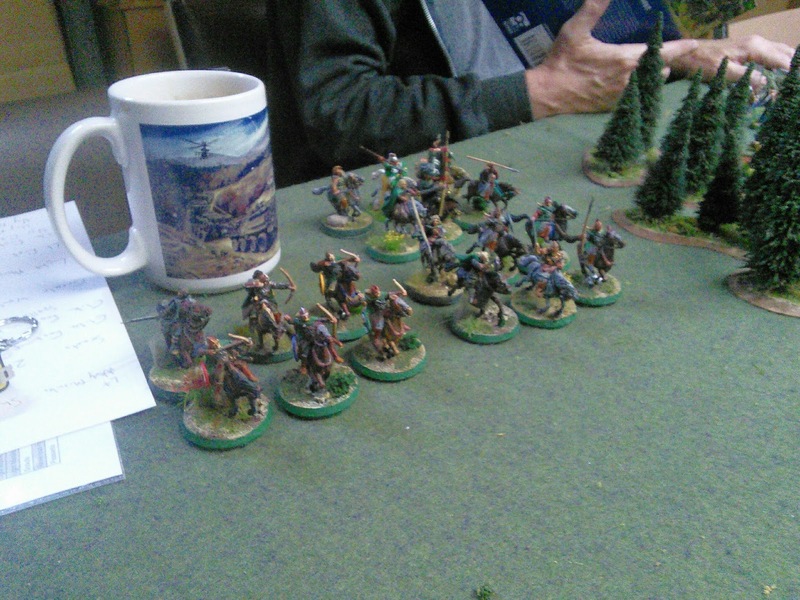 I hope 10 are enough. 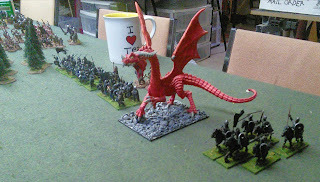 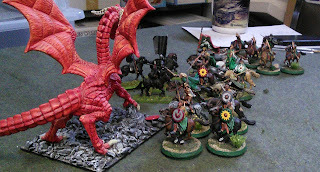 Geek Therapy; Dragon Rampant in our Pyjamas. 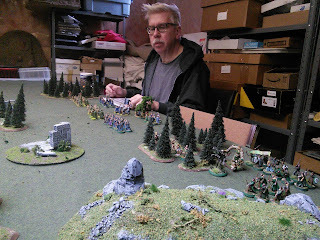 The Mad Padre and I have been trying to book another gaming playdate ("Operation Thundering Dice 2017") all year. 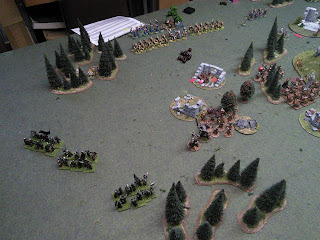 But other things have taken priority. 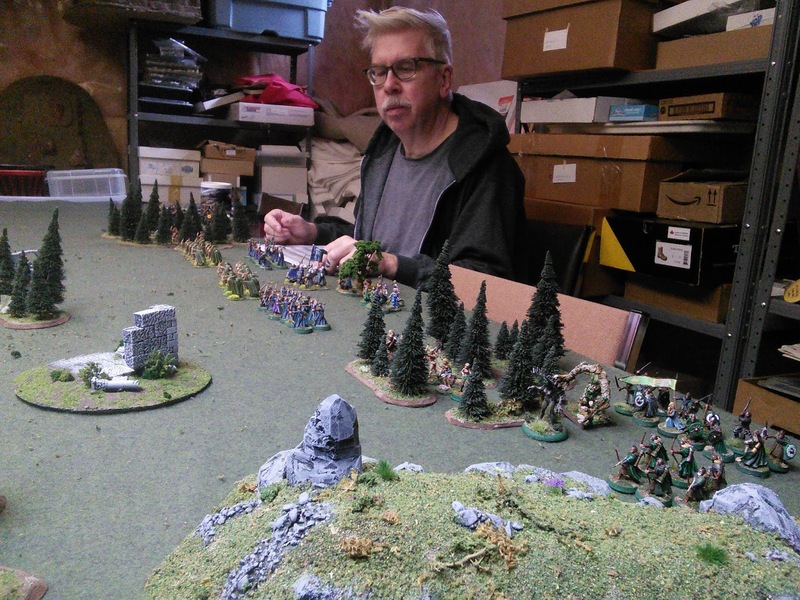 This past Friday a worn Mad Padre arrived at the Townhouse of Solitude for some much needed geek therapy. 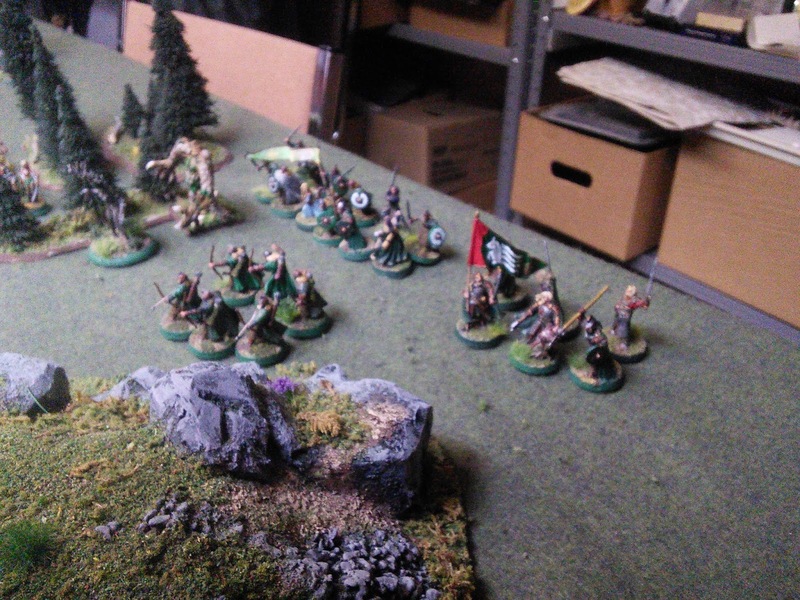 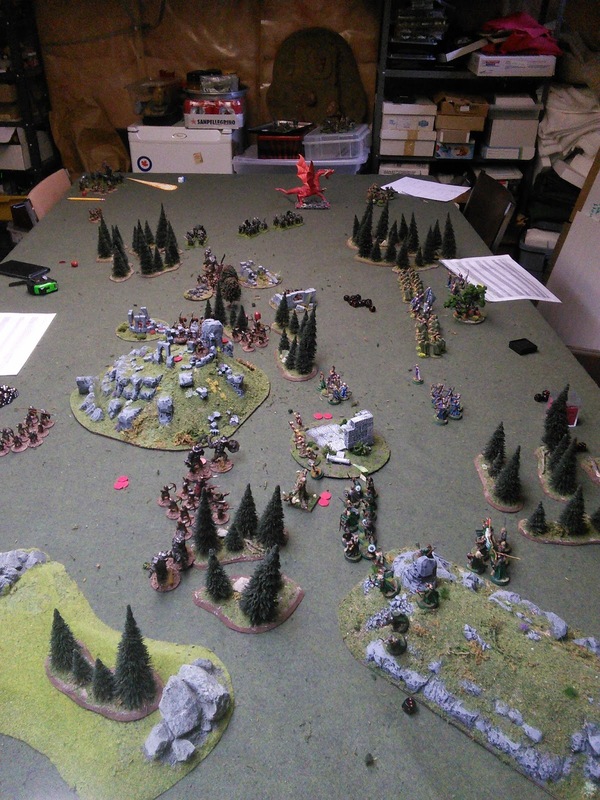 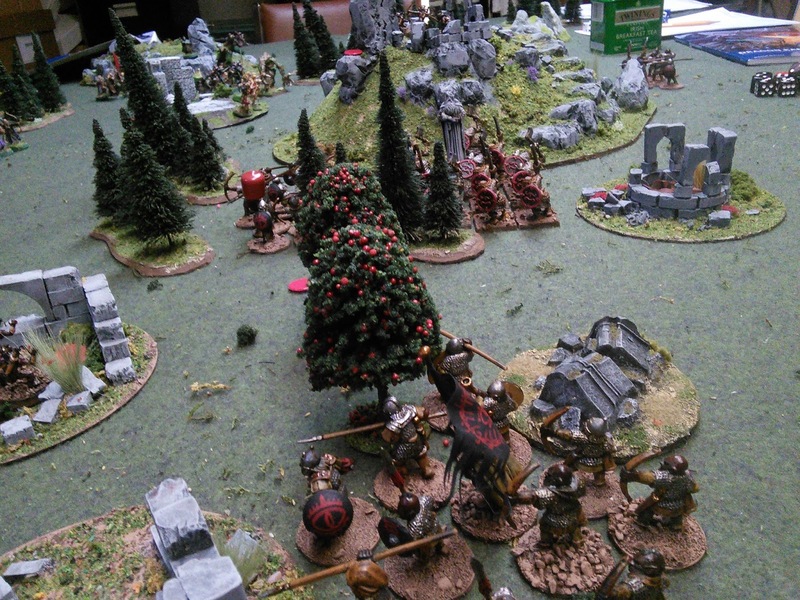 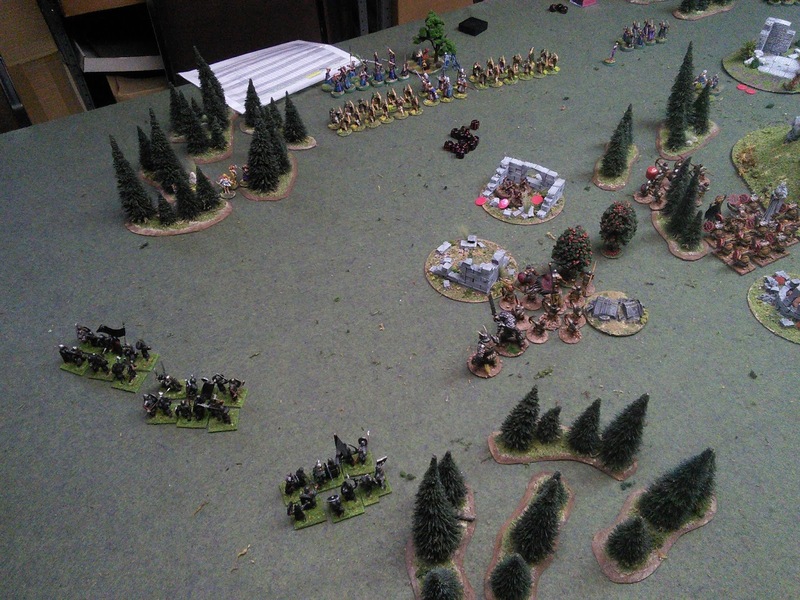 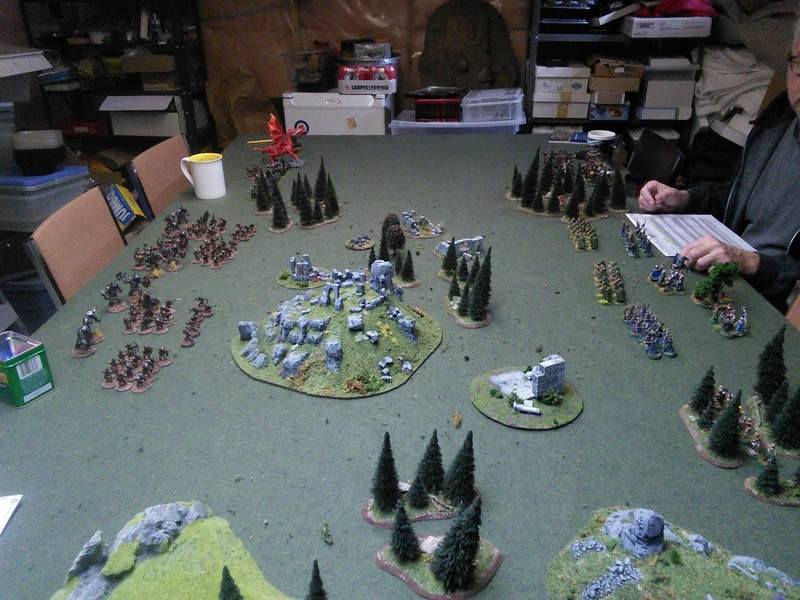 He'd brought his Lord of the Rings kit, so a big game of Dragon Rampant was set up before we went to bed. The objective was to control the ruined town in the middle of the table. 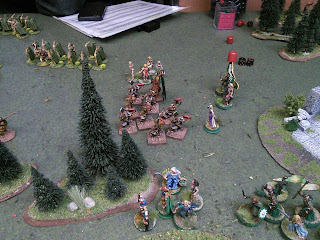 High roll got to pick a table edge and deploy second. 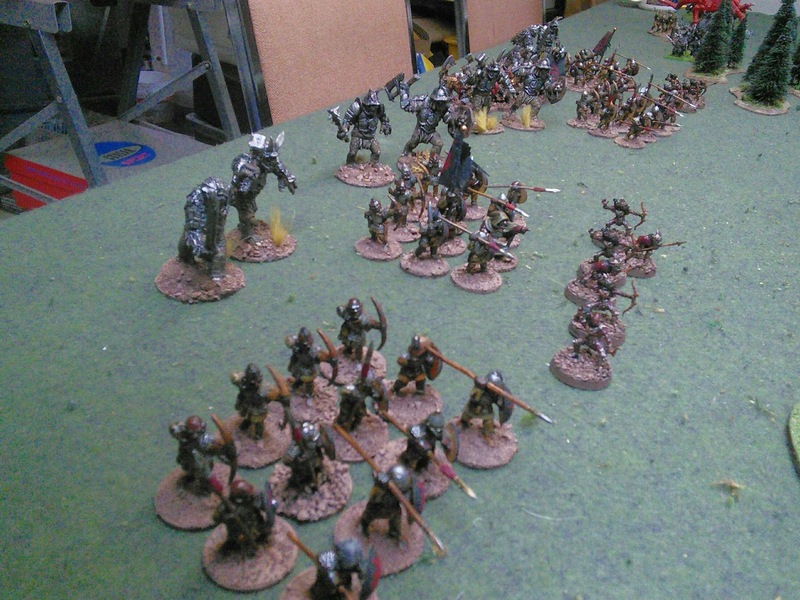 I sorted out a 99 point army for the Witch-King. 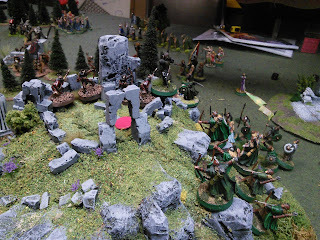 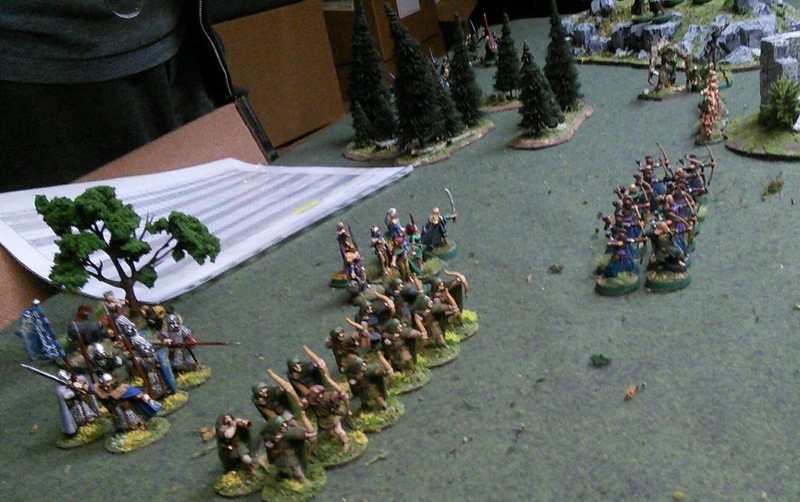 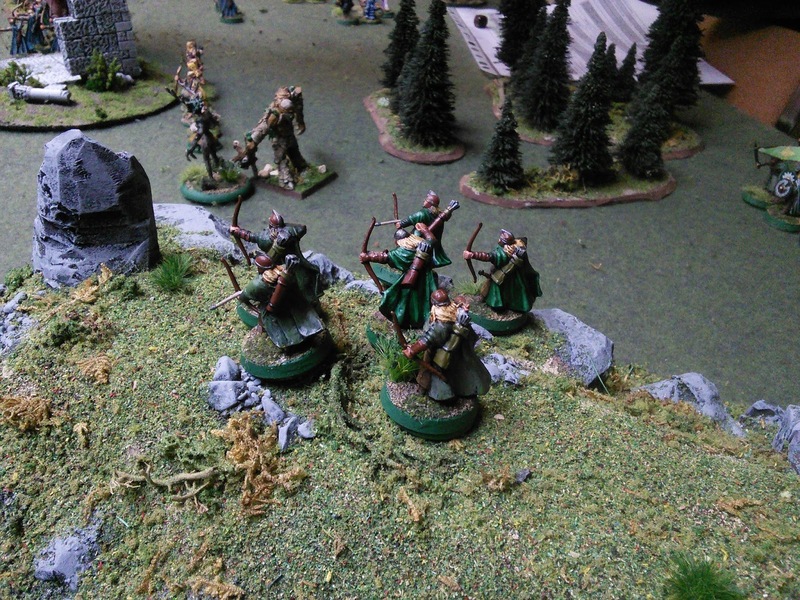 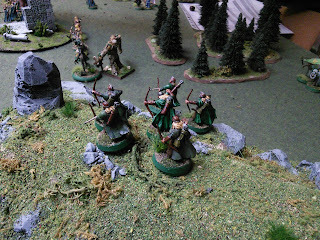 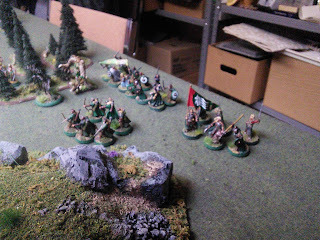 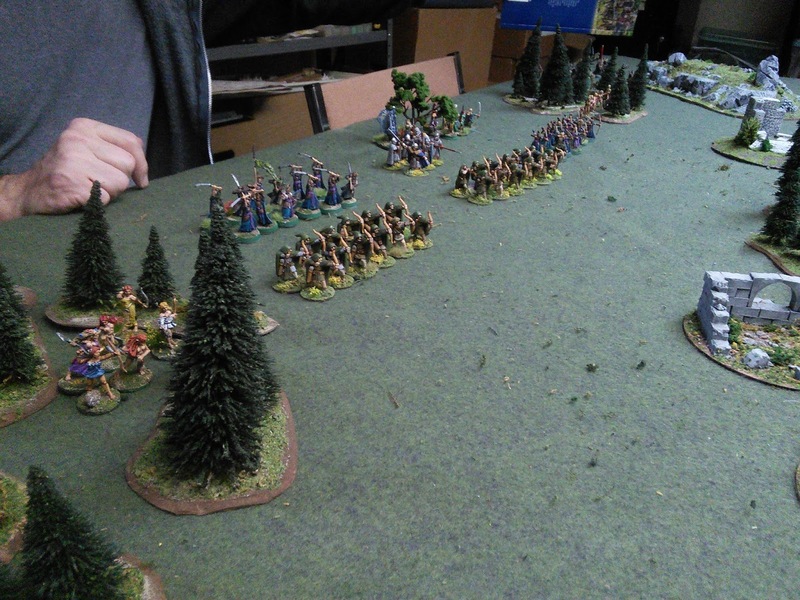 Mike was able to field an alliance of Elves and Men by borrowing from my Elves. 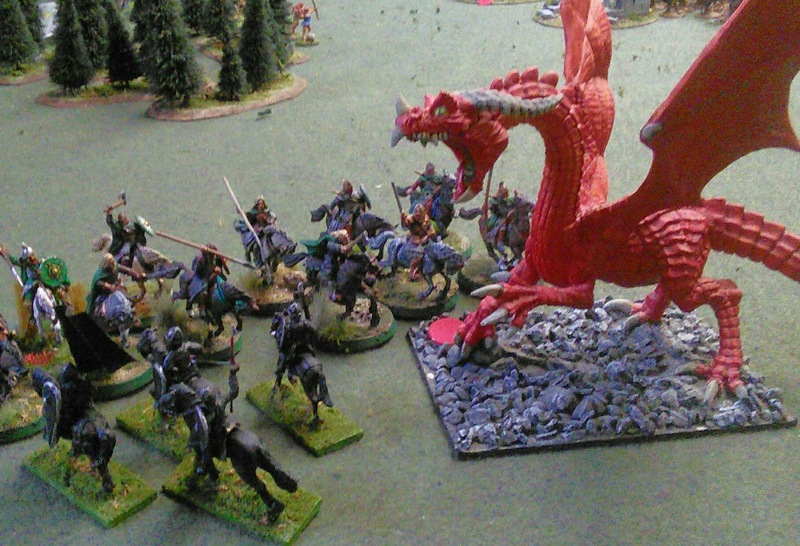 The army of Angmar was divided into four commands, with the dragon being a separate 20 point command on his own. 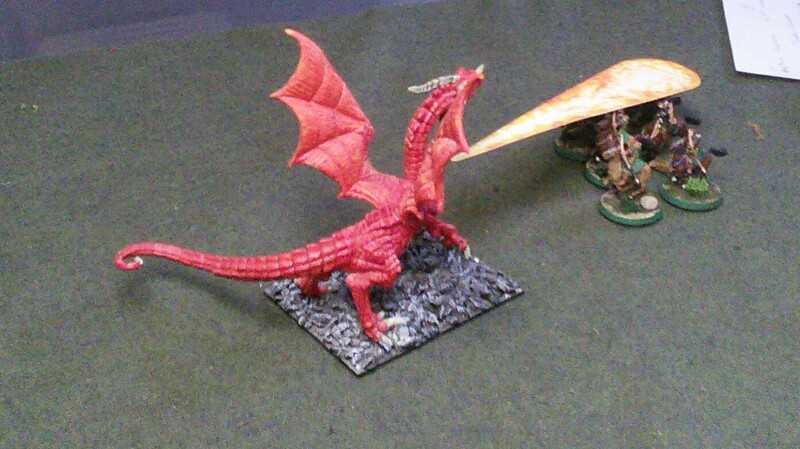 On the Facebook Dragon Rampant forum there has been some discussion of "epic warbeasts"; head and body are each one greater warbeast (head has flame and cunning, body has flight and cause fear). 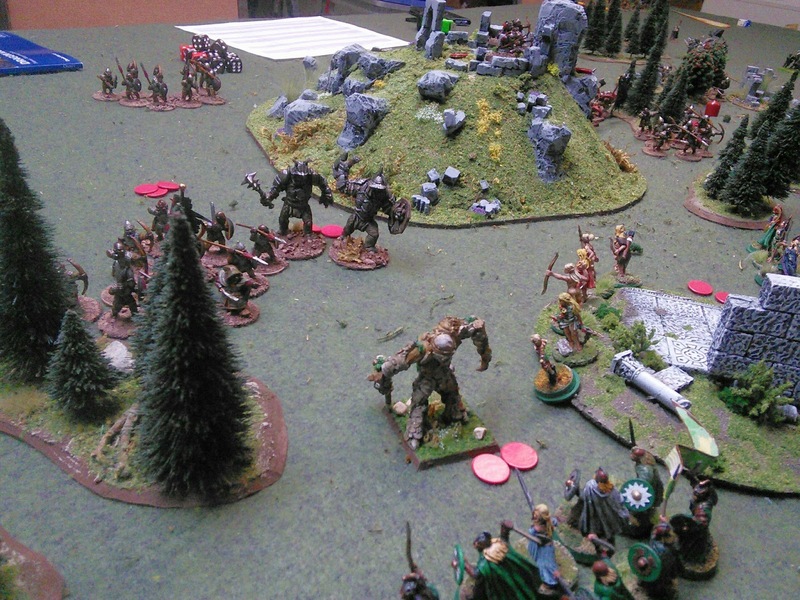 So lots of hit points, but if either portion is killed or routed the whole beast is killed or routed. 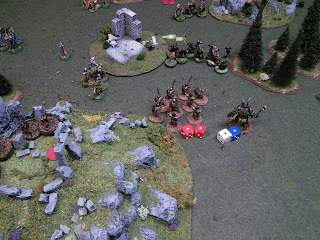 Saturday morning, after some bacon and eggs and lots of tea, we went downstairs in our pyjamas to start rolling dice. 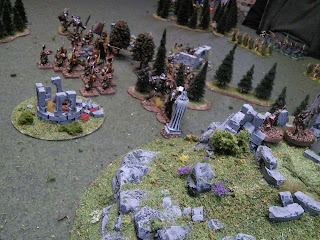 Free Folk Right; Riders of Rohan (heavy riders one unit with bows) and the essential tea. 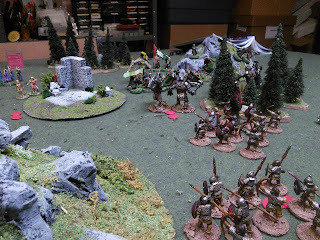 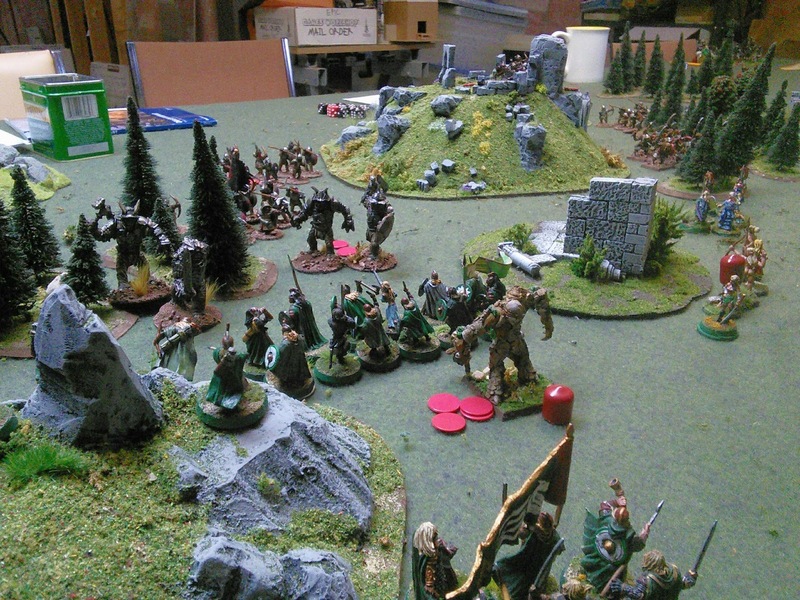 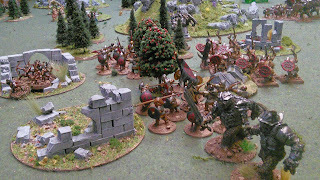 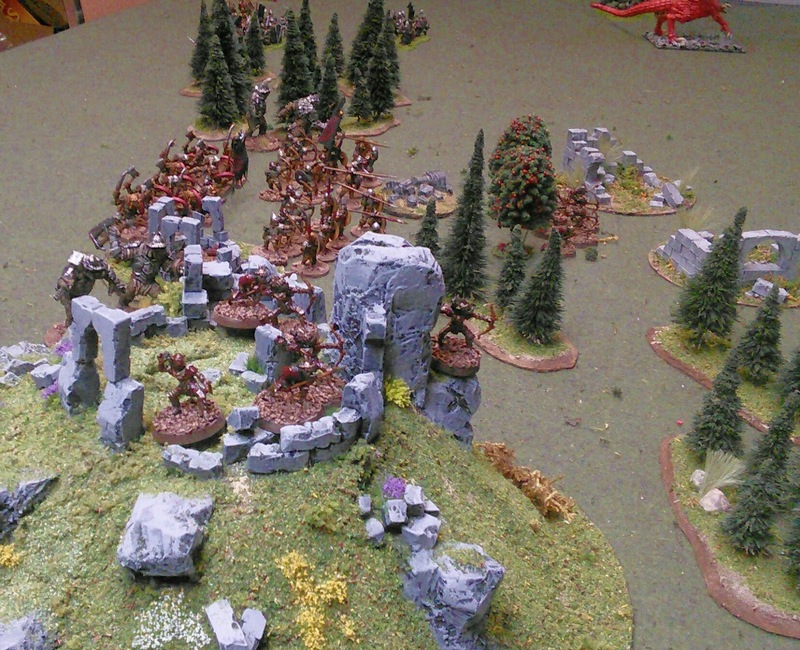 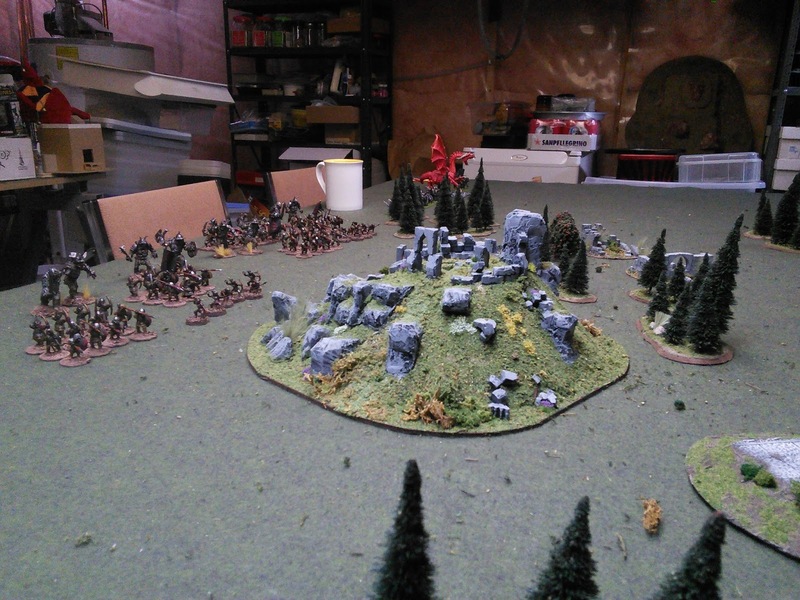 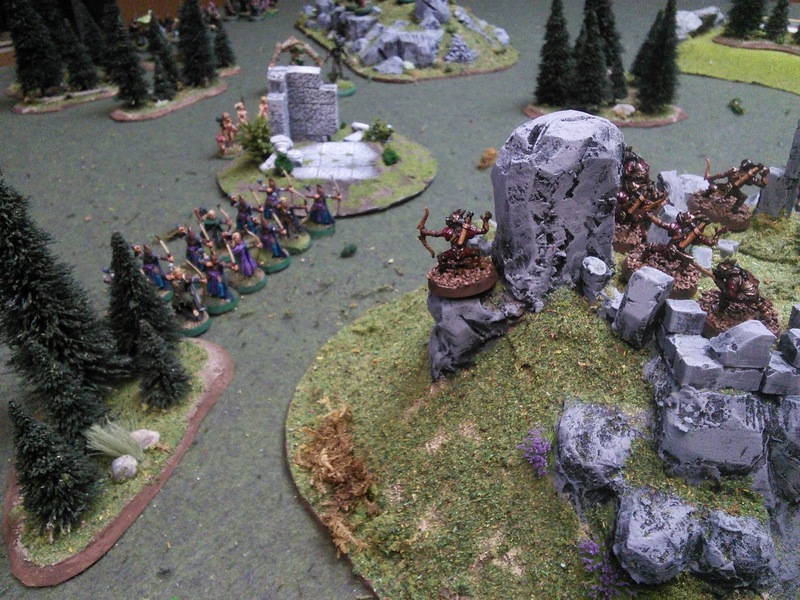 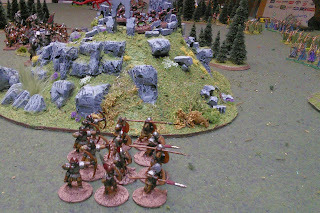 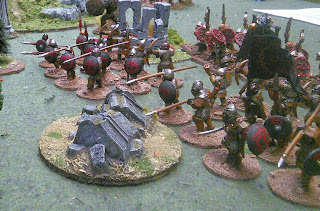 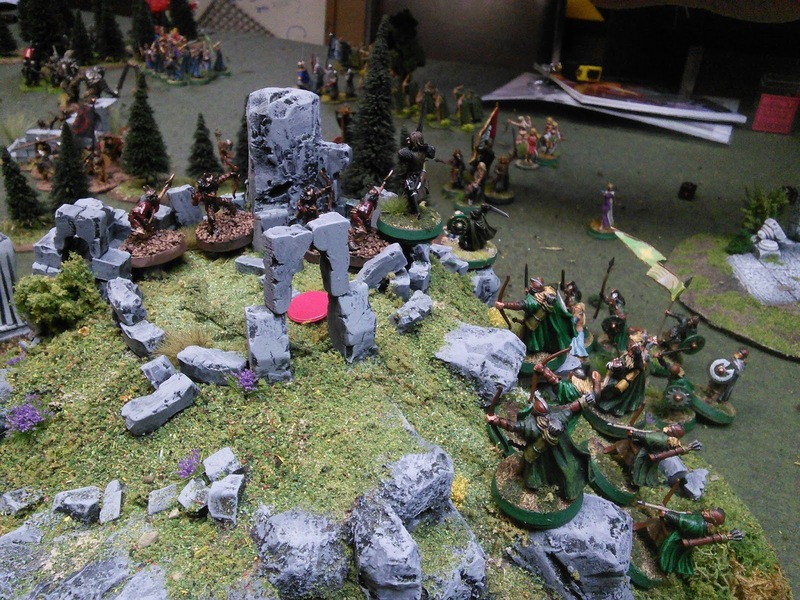 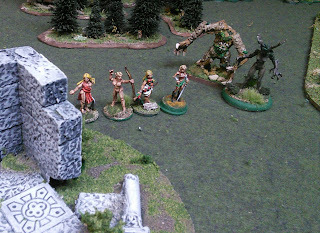 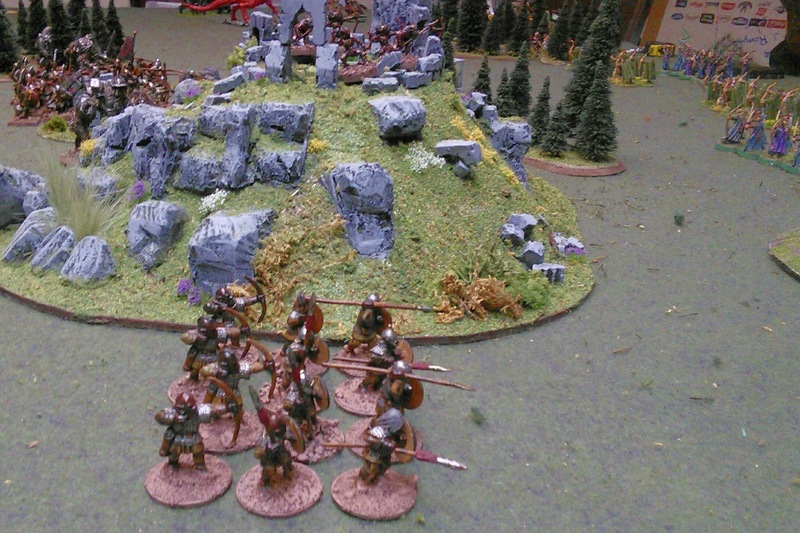 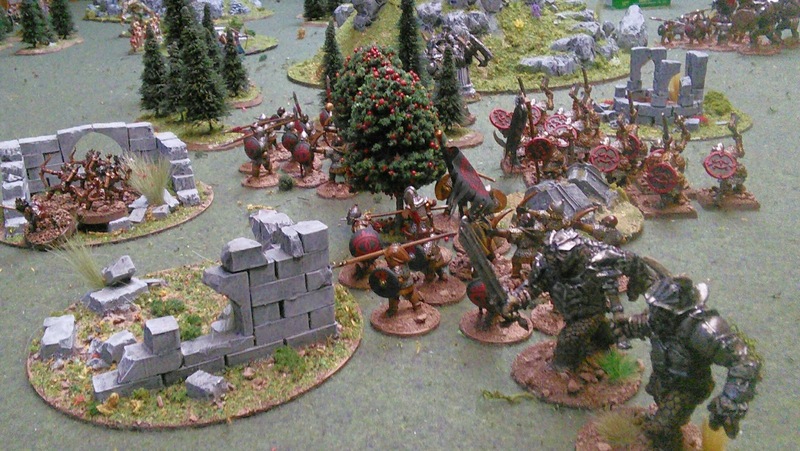 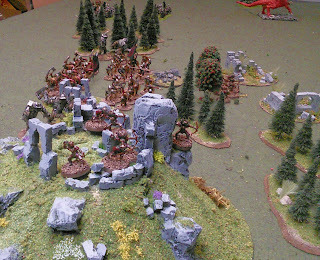 Goblin centre holds in the ruins, waiting for the flanks to put pressure on the Elves. 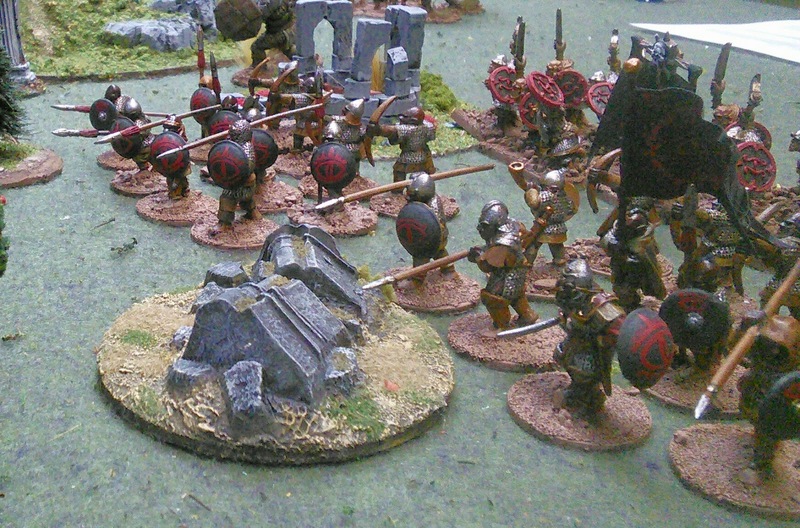 Angmar's high water mark on the right. 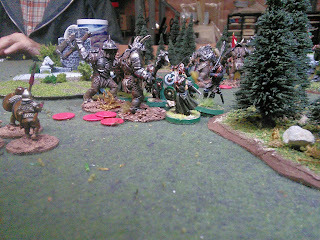 Elf elite foot stop my flanking move. Rout the unit kill my division commander and cause a cascade of courage tests. 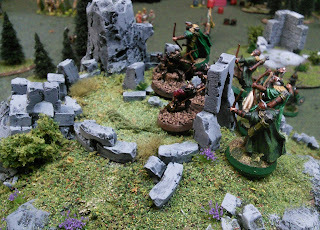 Merry kills one of the trolls. When you roll badly for Courage twice. 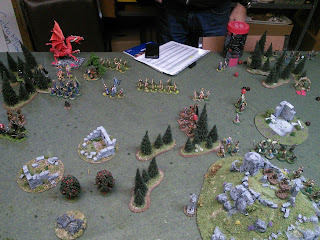 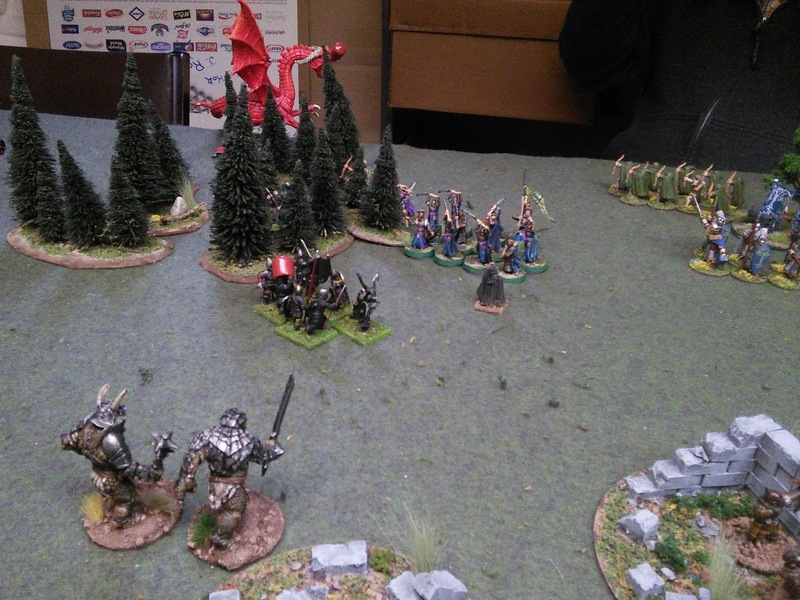 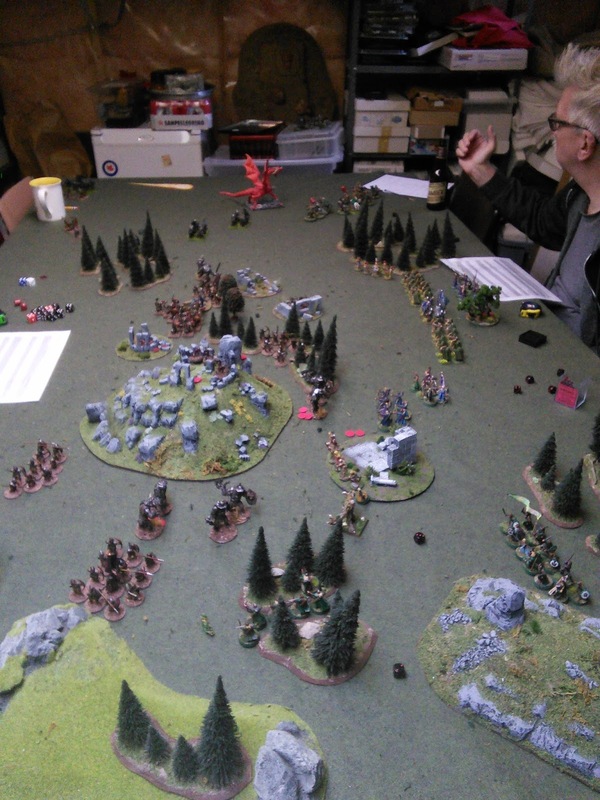 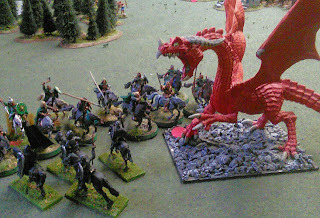 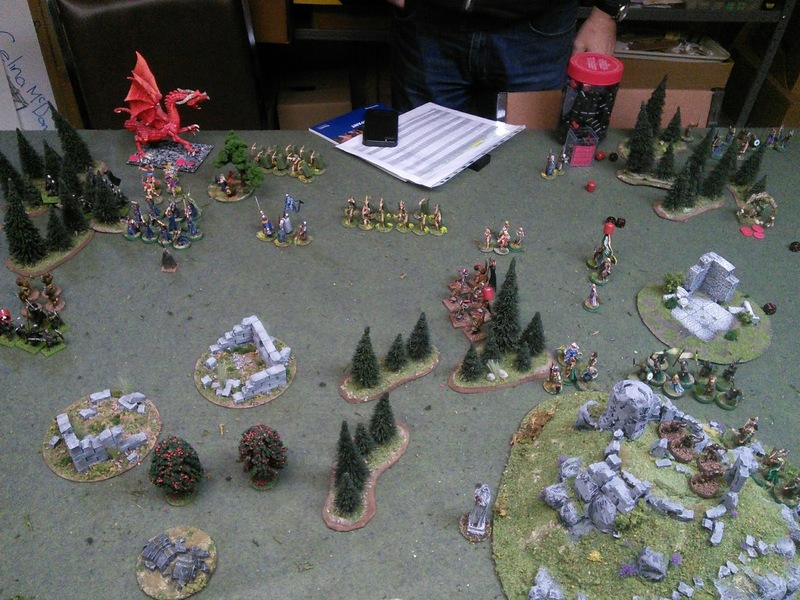 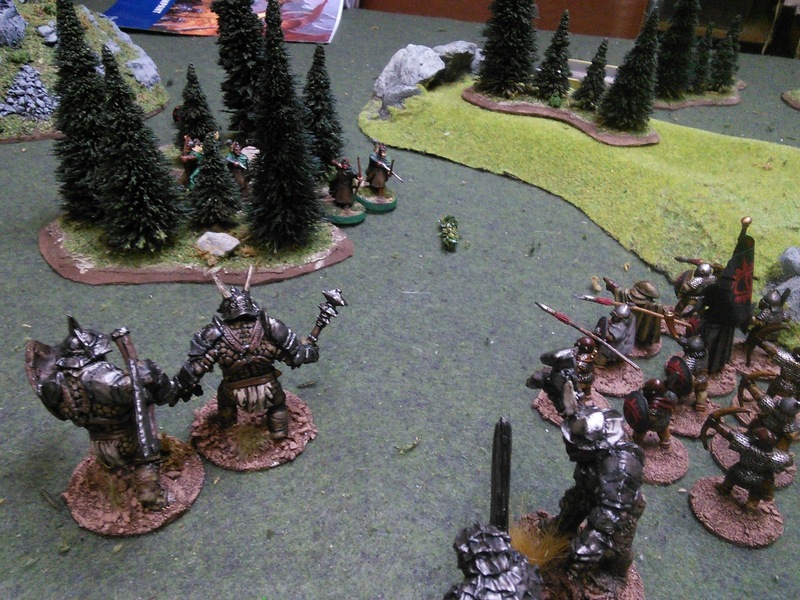 The Dragon has flanked the Elves, but his fire attacks on the Elf sorceress fail. 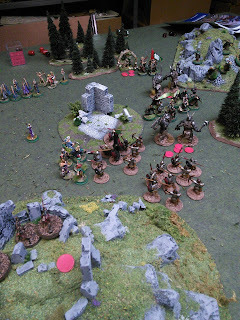 The goblins are destroyed and the men are retreating in tatters so he packs it in. 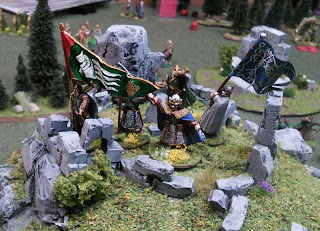 Victory for Elves and Men! 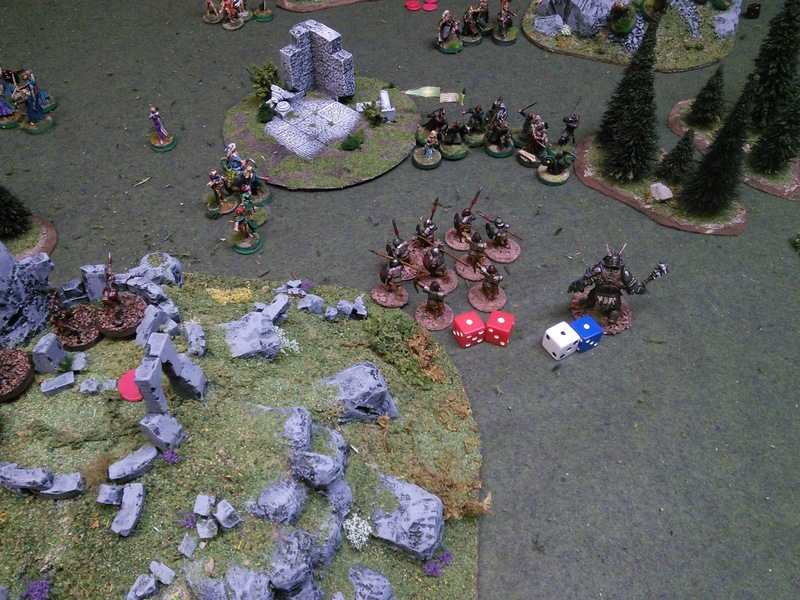 Smoochie, Morgoth's cuddliest minion, is the trophy for the victorious Padre. 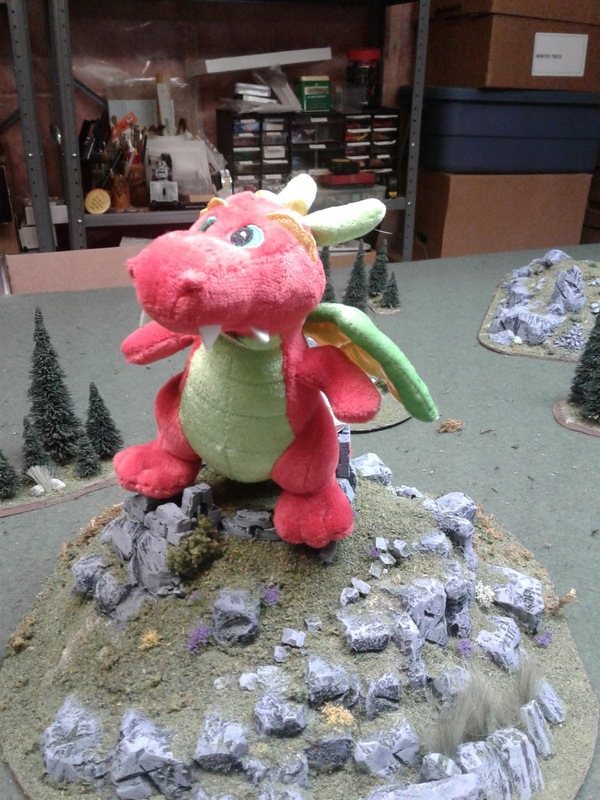 I was going to write a clever story in the dragon's satiric voice, but it's been a week of heavy overtime before the Christmas break, so my muse is tired.